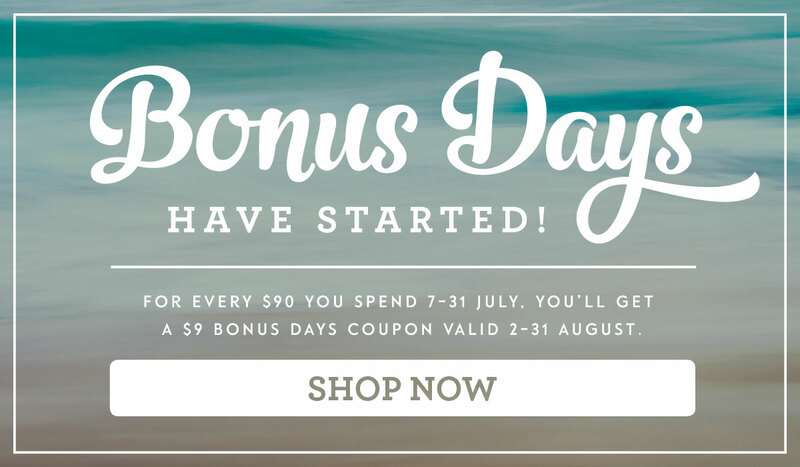 BONUS SHOPPING DAYS IN JULY 2016!!! Did you get everything you want from the new annual catalogue yet? Since it only came out a month ago, you probably still have some items on your wish list, and we have some great news for you! For every $90 you spend in between 7 July and 31 July (before shipping and handling), you’ll get a $9 Bonus Days coupon that you can use 2–31 August. This is a great opportunity to shop from your wish list, whether you buy your favourite products now or later in August with your coupons. This would be a PERFECT time to stock up on the essentials - Cardstock, envelopes, SNAIL adhesive, Stampin' Dimensionals, Designer Series Paper, etc. Check your supplies and make a list! A valid email address is required to participate in this promotion; Bonus Days coupon codes can only be delivered via email so MAKE SURE your email address is correct. SAVE THE EMAILS containing your Bonus Days coupon codes OR print out the coupons. Codes cannot be resent if the email is lost, and lost codes cannot be recovered. Thank you so much Yoga for stopping by I very much appreciate it.